The Tom Ade Ceramic Tile Scholarship has been established by the NTCA to provide educational opportunities for children or grandchildren of NTCA Contractor Members. 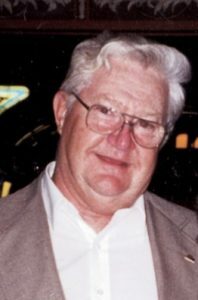 The scholarship’s namesake, Tom Ade, is a former NTCA Regional Director and a previous recipient of the NTCA Ring of Honor and Tile Person of the Year awards. Through his generosity and support of training and education, funds have been earmarked to launch this scholarship. The scholarship will encompass a contribution to the educational institution of choice for the winning applicant. In addition, NTCA will cover travel and registration costs to attend Coverings, where the award will be presented, to be held next year in Orlando, Fla. from April 9-12 at the Orange County Convention Center. The winning applicants will be recognized during the NTCA Awards reception. It is mandatory for the recipient to be present at the awards ceremony to receive the award; otherwise an alternate recipient will be named. Funds are made possible through the generous donations of NTCA members; total donations will determine the number of scholarship recipients each year. Applications will be reviewed by a committee of the NTCA Board of Directors and members of NTCA staff. Recipients receive a $4,000 cash award. Additional $2,500 scholarships may be awarded, based on donations made to the Association Scholarship Fund. Following are the winners of the 2018 Tom Ade Ceramic Tile Scholarship, all of whom received a $4,000 cash award: Heather Sinclair, Olivia Owen, Nicholas Certeza, Hannah Stovall and Madison Walker. Visit this link for scholarship information and application: https://www.tile-assn.com/page/TomAdeScholarship or contact Bart Bettiga at [email protected] if you are interested in supporting the scholarship program with a donation.. 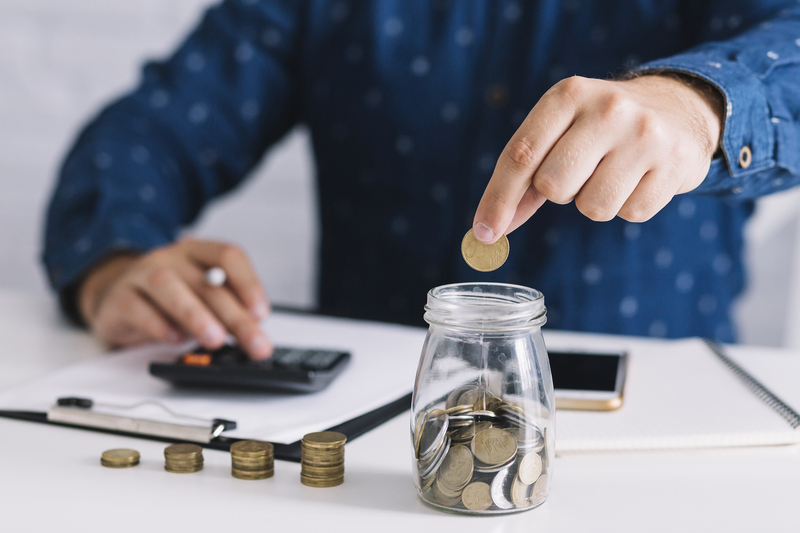 If you’re a small business, one of the things you may struggle with is saving successfully for your eventual retirement, or managing the paperwork associated with a retirement plan. By joining the National Tile Contractors Association 401(k) Plan you are able to provide a powerful retirement plan, help save money, and spend less time administering it. Cost savings on the investments. The National Tile Contractors Association 401(k) Plan – from a government reporting standpoint – is treated like one large plan. The end result for you is a 401(k) plan with competitive investments, outstanding service, and someone else doing a majority of the plan maintenance legwork. With 1,500 members in our association, we bring a large, powerful group to one unified plan. When you utilize the National Tile Contractors Association 401(k) Plan, you have all the advantages and flexibility of a stand-alone plan sponsor, but avoid the expenses and administrative burden associated with sponsoring a single employer plan. The result is that you have to invest less time in paperwork and more time in running your business. Find out more and get the process started. Contact Rachel Walsh, Transamerica Sales Director at [email protected], 727-221-9126. 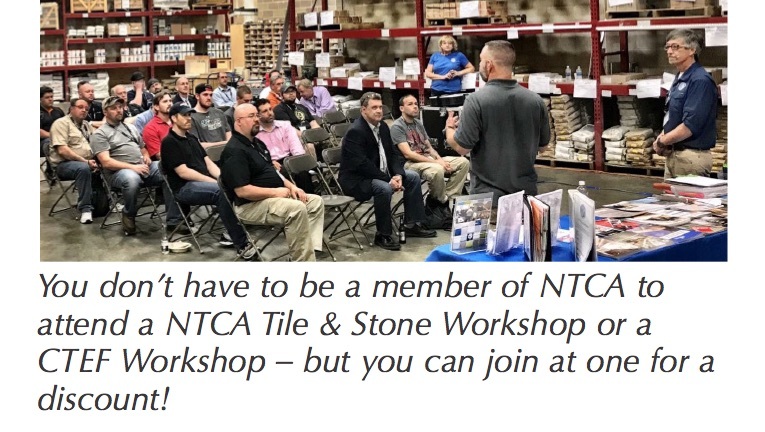 Over the summer, the NTCA produced a 5:57 minute video for use in introducing new tile installers to the trade and spreading the word about the many opportunities available in tile setting and finishing. It’s designed for those in the tile industry or in education to take into high schools and trade schools to raise awareness and interest in what the tile trade has to offer. Narrated by NTCA executive director Bart Bettiga, it focuses on the timeless aspect of tile, and the craft of tile installation as an opportunity for a rewarding construction career. Art, math, science, and language skills all come into play in this multifaceted line of work. It explains that tile setters and finishers will learn and weave together creativity, exacting standards, business acumen and a variety of attributes into a hands-on career that cannot be outsourced. And because tile setting is a highly skilled career, qualified and certified tile installers command better compensation than those who trade in low-use products and services. The video points out that tile setting and finishing are also professions where, in many cases, you can earn as you learn with on-the-job mentorships and apprenticeships that build trusted partnerships between you and your employer. In addition to directing viewers to resources to get more information on potential employers, it spells out personal attributes possessed by successful tile setters: they are dependable, hardworking, mechanically inclined, have a sense of urgency, and are self motivated critical thinkers. Tile installers also benefit from being skilled in communications, time management, planning, with leadership abilities and the ability to retain knowledge. And installers and finishers have the satisfaction of having been part of visual landmarks in the community and creating functioning works of art. You can find the video on the National Tile Contractors Association YouTube channel at http://www.youtube.com/c/NationalTileContractorsAssociation. NTCA has a strong focus on training and education for the technical aspects of your business. But we also realize that being in business isn’t solely about the physical, hands-on aspect of setting tile – if you are to be a successful business person, having a clear, well-crafted business plan can mean the difference between just getting by and thriving in your work. 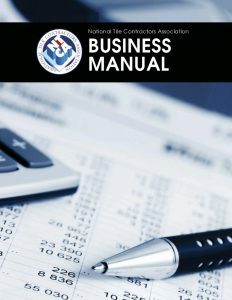 With the recent addition of two new NTCA staff members – Stephanie Samulski, Director of Technical Services, and Avia Haynes, Director of Marketing & Communications, the Business Committee will be moving ahead to update, refine and prepare this manual for widespread use within the membership. Stay tuned! Want to have a web presence but not sure where to start? A new NTCA member benefit, family-owned Enter.Net, based in Allentown, Pa., specializes in state-of-the-art web design, SEO (search engine optimization) and social media. Enter.Net was voted “Best Web Design Company” for 13 years in a row by McCall’s Reader’s Choice. They design and host over 1,000 websites and are currently running a 40% discount off all business web services for NTCA members. Web Design – Enter.Net ensures that your web presence looks amazing and is responsive on ANY platform – computer, tablet, and phone and merges platforms to bring the work you do on social media to a company-specific and branded “home” on the web. Search Engine Optimization – Be found easily by prospective customers, stay ahead of your competition, and get top rankings on Google, Yahoo and Bing with monthly ranking reports – all at an affordable price. Social Media Marketing Strategies – Use social media efficiently and effectively with Enter.Net’s expert marketing strategies and tools that allow you to reach all your audiences with one click. Custom Marketing Media Packages –Integrate your presence and your message starting with your logo, moving to print pieces, email blasts, custom video products and billboard and ad design. Everything you need to keep your company in front of potential customers. [email protected] for information about membership. One of the benefits of becoming a member of the NTCA is the “Partnering for Success” program. The manufacturing sponsors of this program feel strongly about the value NTCA provides and have agreed to offset your investment by providing these product vouchers. As a paid new or renewing contractor member of the NTCA you will choose $2,000 of FREE product vouchers from four categories of the $6,960 that is available. Each year the program will continue to grow as more sponsors come on board. Receiving your vouchers isn’t automatic – you need to select what you’d like, so you can tailor your selections to what’s best for your business. How does it work? Once you sign up as a contractor member, you’ll receive an email with a custom link to the vouchers. Go to the link, select vouchers from all four categories up to the Section Allowance for each category and submit your selections by November 15. You’ve got to choose all your vouchers at once and remember, vouchers expire December 15 of every year, so joining early in the year gives you the most time to use them. Category 1: Tile Options – Section Allowance $600 –Sponsors include: American Olean, Crossville, Daltile, Emser Tile, Florida Tile, Marazzi, Metropolitan Ceramics, The Tile Shop. Category 2: Tools/ Heat Systems – Section Allowance $350 –Sponsors include: Alpha, ATR, Gundlach, Mark E. Industries, Miracle Sealants, NTCA Tile Tool, Nuheat, Porcelain Plus Speedbit, QEP, Rubi, SunTouch, Warmly Yours, Just Warm It. Category 3: Sundries – Section Allowance $400 – Sponsors include: Aqua Mix, Blanke, Ceramic Tool Co., Compotite, Contractors Direct, Hardiebacker/Home Depot, Hollspa, MAPEI, MD Pro, NAC Products, National Gypsum, Noble Company, NTCA Online Store, NTCA University, Oceancare Enhancer, Oceancare Sealer, Proflex, Schluter Systems, Trimaco, USG, VanHearron, wedi. Category 4: Setting Materials – Section Allowance $650 –Sponsors include: ARDEX, Bostik, Custom Building Products, C-Cure, LATICRETE, MAPEI, MERKRETE, TEC, Texrite. Here’s a detailed list of what’s available. http://www.tileletter.com/vouchers/. Do you have more questions? Call Jim Olson at 601-942-2996 or email [email protected]. Business challenges have HR solutions. Insperity®, a trusted advisor to America’s best businesses for more than 31 years, provides an array of human resources and business solutions designed to help improve business performance. Insperity® Business Performance Advisors offer a comprehensive suite of products and services. Insperity delivers administrative relief, better benefits, reduced liabilities and a systematic way to improve productivity through its premier Workforce Optimization® solution. Additional company offerings include Human Capital Management, Payroll Services, Time and Attendance, Performance Management, Organizational Planning, Recruiting Services, Employment Screening, Financial Services, Expense Management, Retirement Services and Insurance Services. Insperity business performance solutions support more than 100,000 businesses with over 2 million employees. With 2017 revenues of $3.3 billion, Insperity operates in 68 offices throughout the United States. The partnership between Insperity and NTCA provides preferred member pricing on select Insperity® HR solutions. As an NTCA member company, you can customize your back office from the many products and services Insperity offers. Visit http://bit.ly/2HPDyF3 and scroll down to learn more about Insperity while exploring member benefits on the NTCA Why Join? For information about membership, contact Jim Olson at [email protected].